While I was at CTIA Fall 2010 in San Francisco, I got a chance to meet with the Energizer people. They were pretty excited about their wireless chargers, but they were also showing off their Portable Power Travel Kit. 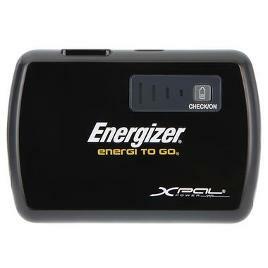 The Energizer Energi To Go Portable Power Travel Kit has a set up that I have seen before, like on the PowerPak from Technocel. This kit comes with this rectangular battery unit that you see here. It can be charged up via USB. You can also plug it into the wall or even to a dashboard cigarette lighter. The unit has an indicator with four bars that will all be illuminated when the battery is full. From there, you can charge a device like an iPod, or something with a mini USB. It has a two other connectors that I don’t recognize, but this product can charge most of the most popular mobile gadgets. This kit also has a travel case that puts the battery and the resultant connectors (including the plug-in) all in one zipper pouch. It looks like this product would be a good gift for someone who travels, and you should be able to get it at Sky Mall for about $69.99. good stuff, smart solution for charging gadget.